It can be overwhelming. We can help. It’s always curious to me to hear what prompts people to start planning for retirement. Most often, there’s a triggering event that prompts you to start thinking about it. Generally, it’s somehow related to the notion that time is our greatest resource, and at some point, we’re all going to run out of it. Specifically, that may be someone you care about getting sick, or maybe it’s just that the work you’ve been doing is no longer fun, and you long for something different. Whatever the triggering event is, it wakes up that voice in your head that starts telling you that you better get busy with a plan to live the life you want. In my experience, that’s when you decide it’s time to start planning for retirement. What kind of life do you want? For some people that may look quite a bit different than the life you’re currently living. How is your time currently spent? How would you prefer to spend it? Maybe you’d just like to maintain your current lifestyle, without any major changes? I meet lots of people who love what they’re doing and aren’t interested in “retiring” any time soon. For them, it’s more about financial independence. Knowing that they can afford to do what they want and having a plan in place in case something unexpected happens. Figuring out what those goals look like is the first step in the planning process. How does that saying go? If you don’t know where you’re going, it’s hard to know whether you should take a car, a boat or a plane. Once you know (or have some idea) where you’re going, only then can we try and figure out how much it’s going to cost. This can be scary. I meet people who are afraid that they might not be able to afford the life they really want, so they never make the effort to find out what’s possible. While the reality is that you may not be able to get everything you ever wanted, there may still be some very nice possibilities. I break it out into three “buckets”. Needs, wants, and wishes. If we can take care of what you need, you get peace of mind. If we can take care of your wants, you get a sense of satisfaction. If we can cover some of your wishes, then that’s where elation comes from! Getting clear on what you want is the critical first step in figuring out how much money you’re going to need to pay for the life you want. As is so often the case, timing is a big factor. When do you want the things, you want? Making sure you have the money when you need it is important. Playing golf and travelling the world becomes a lot less appealing later in life when backs, knees, and hips are aching. On the flip side of that, knowing that you aren’t going to run out of money later in life is also very important. The ability to find that balance between the life you want now and the peace of mind that you’re going to be okay in the future is critical. Understanding when you’re going to need the money and for how long are important things to figure out. With the what and when figured out, then it’s time to work on the how. How are you going to grow your savings into enough money to pay for the life you want, when you want it? While everyone likes when their balances go up, numerous studies suggest that the pain of market declines is much worse than the pleasure derived from rising markets. Finding the right mix is critical. Understanding how to put together a diversified portfolio that gives you the growth you need and the protection that will allow you to sleep at night during the inevitable downturns is tricky. It’s also critical to your success. Relatively small differences in returns compounded over years can add up to very different results over the long run. 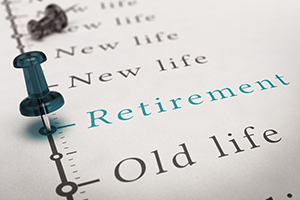 What stage are you in with your planning for retirement? Are you feeling good about your plans? If you’re not, or you’re feeling stuck, let us know. We can help!